Daily life discolours teeth and can leave you with an off-white smile you’re keen to hide. Manufacturers of toothpaste and home whitening kits may make outlandish claims, but in reality the only thing that will really work is a dentist-based procedure. Tooth whitening lightens the shade of your teeth and helps to remove stains and discoloration, giving you the Hollywood smile of your dreams. 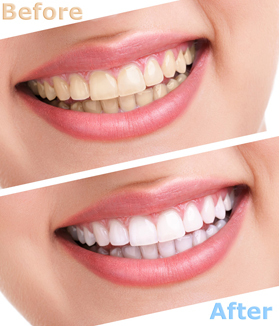 Tooth whitening treatments carried out by your dentist, while long lasting, are not permanent. Custom made trays which are an exact replica of your teeth can be used with whitening gels in order to help maintain the desired colour. The trays are a one-off purchase, custom made by Lockerbie Dental just a few days after the impressions of your teeth have been taken. Your dentist will provide detailed instructions on exactly how to use them and the solution can be purchased from us, allowing you to top-up your smile at leisure. Call us today on 01576 204 724 to book your FREE Tooth Whitening consultation. The relatively new air scale polisher can lighten your teeth by up to one shade. The quick, easy and pain free treatment, which costs just £54.90 at Lockerbie Dental, is perfect for patients whose teeth have become discoloured from smoking or drinking tea, coffee and red wine. The technique uses a machine which releases a fine stream of silica particles. The polish will remove stains, plaque and tartar and yields impressive results, way beyond a regular scale and polish. Book your FREE trial of the air scale polish now.